A video still from Gary Lo’s 700L reef aquarium in Taiwan. Every once in a while you stumble across a hidden gem online. For me, this often happens via video suggestions on YouTube. I found this reef aquarium by Taiwan’s Gary Lo captivating. The aquarium comes in at 700L, or roughly 185 gallons. If Google Translate is working properly, it sounds like Gary Lo retired from aquariums back in 2014, going out on a high note. For someone who may have only been into reef aquariums for 3 years (again, if translations are working properly), the photographic catalog of his aquariums and their progression over the years represents the pinnacle of what so many new hobbyists aspire to, yet often fail to achieve. While the Tang Police take some issues with Gary’s fish selections, I’m going to pay more attention to two key aesthetic choices Gary had made in the design and maintenance of the aquarium. First, he’s embraced the “less is more” concept of rockwork, allowing ample room for the corals to grow in and function as part of the display. In another video I intend to feature, you’ll perhaps see a different tank on that concept. The other aesthetic choice is to keep the aquariums’ background free of any algal growth. This allows the reef life to remain center stage, and not blend into a coraline algae-encrusted background (plastic textured overflows and backgrounds on aquariums have become the bane of my existence for the simple fact that you cannot effectively keep them free of coraline algae). 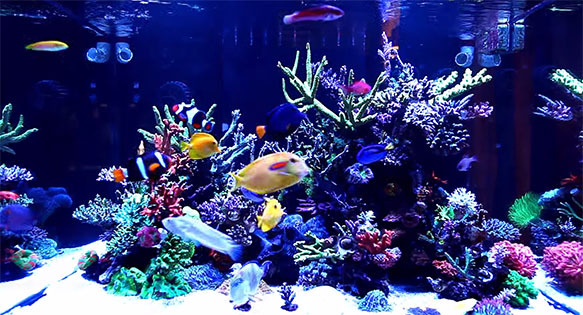 You can probably use a browser translator to follow Gary’s SPS reef aquarium from inception to completion and retirement; start here! Gary left the hobby in 2014 saying he’d be back…I for one am looking forward to what he does when he returns! Note: you can “like” Gary’s Reef Tank on Facebook; hopefully you’ll be among the first to know when Gary comes back! Tank looks too small for all those fish, especially the Orange Shoulder Tang.